Running out of ideas for Preschool Circle Time? Every preschool program needs circle time for group interaction. This is a time to build structure into the program, so the children know what to expect each day. It is great to offer circle time at least twice a day- once in the morning, and once just before time to go home. These ideas will help build a sense of togetherness, (community) a time for sharing, and a fun learning environment for the kids. Enjoy! 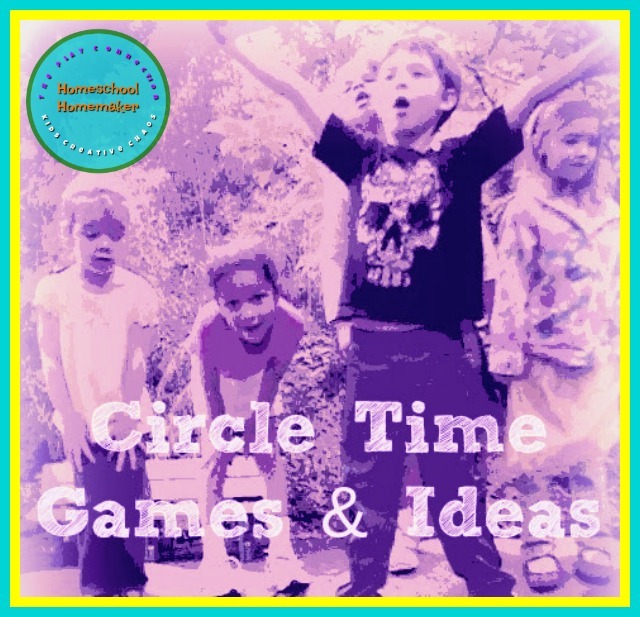 Elementary Circle Time Games, Activities, and Ideas for Preschoolers and Toddlers. 1. Dance Freeze - Play some music or sing a song. Everyone dances willy nilly. Suddenly, stop the song, but don't sing to the end of a verse, that is too predictable. Everyone must freeze in their position. Is one leg up? Are they doing the worm? If they move, they must sit frozen in that spot, criss-cross applesauce and wait to see who can freeze the longest. No blinking or twitching allowed. 2. Bug in a Rug - This is an oldie, but a goodie. Everyone sits in the circle. Before you begin to play, explain EXACTLY how the game works. Grab a blanket or a big beach towel. Now, pick one child to leave the room or wear a fun blindfold. Teacher picks a student. Shh! Just point at the child, grab their hand and take them away from the group. Now, point at another child and then to the "rug". Hide the child under the "rug." Bring the other preschooler back. Can they guess who is missing? 3. Pass the Movement - I played this for years with preschoolers and school-age children in summer camps, but I didn't give it a name. I found the name at Preksharing Blog. She says it is adapted from a book published in 2011, but we used to do this years ago in summer camp and afterschool programs. Just goes to show, great minds think alike! It is simple to play. Teacher starts with a movement. Perhaps, you wave your hand in the air. Now, the person sitting to your right must wave their hand and add a movement like wiggling their nose. The next person to the right, does those movements and adds one of their own. It is a "WAVE" of different movements. 4. Shake the Sillies Out - Need a game to get kids' moving? Find some Dragon Tunes from the cartoon, Dragon Tales, and every morning, "Shake the Sillies Out"! Just play the song, and follow the instructions. Kids love this one! 5. 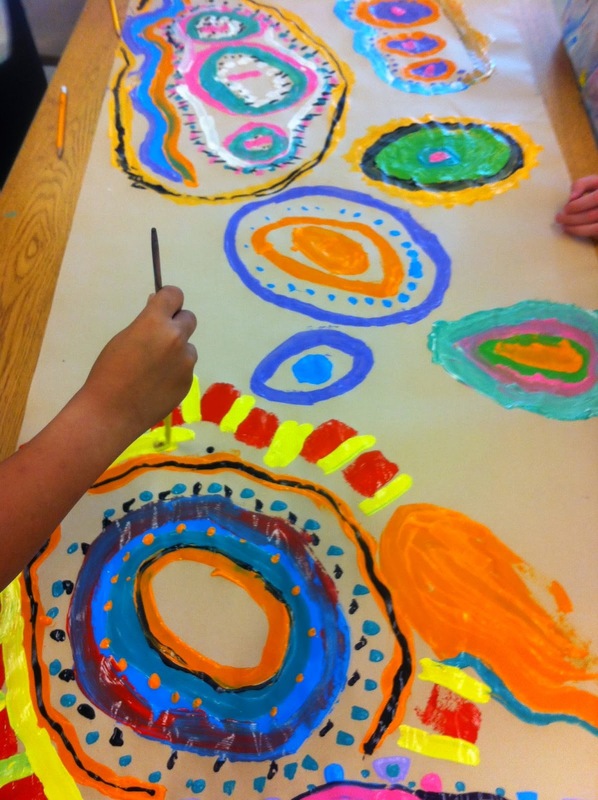 Circle Time Collaborative Painting - I like the idea of painting circles in collaboration like the one from Art Project Girl in the link. You know, where Teach lays out a big sheet of paper and painting supplies and everyone paints concentric circles? What if we do it as a part of Circle Time? Pass the painting, and make a PROGRESSIVE PAINTING. This idea teaches patience. Everyone must wait their turn. It builds excitement too. Lay out a large painting tarp, sit the children in a circle on the tarp, give each child a cup of paint and a brush. No painting unless it is your turn. To make it less frustrating, pass two large poster boards around starting at opposite ends. Children are allowed to paint only 1 circle or shape of their choice per turn. While they are painting, teacher shares an art lesson on shapes! Collaborative Concentric Circle Painting from Art Project Girl. 6. Click, Clack, Moo Story Starter - You know the story about the unhappy cows in the barn? They have a typewriter. They are making demands. An electric blanket would be nice. What else might the farm animals want from the farmer? Click Clack Moo Story Starter Circle Time Game. Play a Circle Time Game where each child is given an animal. Before the game, print out cards with farm animal pictures on one side and their name on the other. Each child draws a card from a hat. Give this example to the kids: What does the (insert animal here) pig want? "Dear Farmer Brown, the barn is smelly. Please send air fresheners." Have each child come up with their own idea for what the animal on the card might want from the farmer. 7. Animal Movement Game - Take the game above one step further. Get the kids moving like the animals. Ask, "What does a pig say?" Now, "How does a pig move?" The children take turns walking around the circle like the animal on their cards. 8. Quiet Mouse, Still Mouse - When Circle Time is done, keep children in a circle to release them to the next preschool activity. The teacher explains, the child who sits as quiet as a mouse (the quietest) get to line up first. Continue until everyone (or almost everyone, I don't like to single out those who can't sit still or quiet) is in line. 9. Calendar Time - Sing "Sunday, Monday, Tuesday Wednesday, Thursday Friday, Saturday. Suunday, Munday... TUUESday" Emphasize the current day of the week. Sing the song and then check the calendar. Who can find today on the calendar? Here's another days of the week song sung to the Addam's Family theme. 10. Alphabet Shopping - Using the first letter of each child's name, pretend to go shopping for an item that begins with that letter. For example, “Jake will buy a jump rope.” Go around the circle until everyone has had a turn. This helps with letter recognition. For more ideas like this visit Early Childhood News. 11. Talking Stick - Bring in a cane, or recycle a cardboard wrapping paper tube. The kids can help decorate the "Talking Stick" with Washi or Duct Tape, Glitter, or Feathers. During Circle Time, grab the stick. Now, explain to the group that this is a talking stick. Only the person who holds it may speak. This is a great tool to use for Show and Tell or other situations where children take turns sharing. More lessons in patience and turn taking. 12. Birthday Day of the Week Bags - PreK Pages Blog has a fun idea for Day of the Week Bags. Make a brown paper bag for each day of the week. Give it a colorful label, and fill it with the names of classmates who have birthdays on this day or other special things that happen on this day of THIS week. 13. Pictures with Facial Expressions - Hold up magazine pictures of facial expressions. Ask, "What is this person feeling." Have the children take turns making the face. After you play this game, have the kids draw themselves like this emotion art lesson. 14. Play Duck, Duck, Goose? - This old standby might be boring to you, but it is likely new to the toddlers and preschoolers in your class. Change it up each day. After they get the hang of the game, add a creative play element by acting it out. Have the kids act and walk like the animal as they toddle around. Walk and Talk like the animal. For older or school-age children, change the theme to pig, pig, cow or ghost, ghost, vampire. Follow us on Instagram for more fun ideas every day!